Part 1 of this series was my first semester working on my desk. Now that I’ve completed my second semester – here’s Part 2! I really had not clue about how long it would take to build my custom desk out of raw wood. I can tell you my expectations where higher than they should have been! This last semester in the woodshop kept me busy but just by looking at my project, you wouldn’t be able to tell all that I actually did with the time I had! When the semester started all I had was the bottom carcass glued up, the top-working surface glued as well as my top-side panels. I started with getting the carcass ready to have the top glued on. Originally, I didn’t consider how the cross rails on the side panels have the wood grain running horizontal and how the grain on the top piece would be running parallel to that. 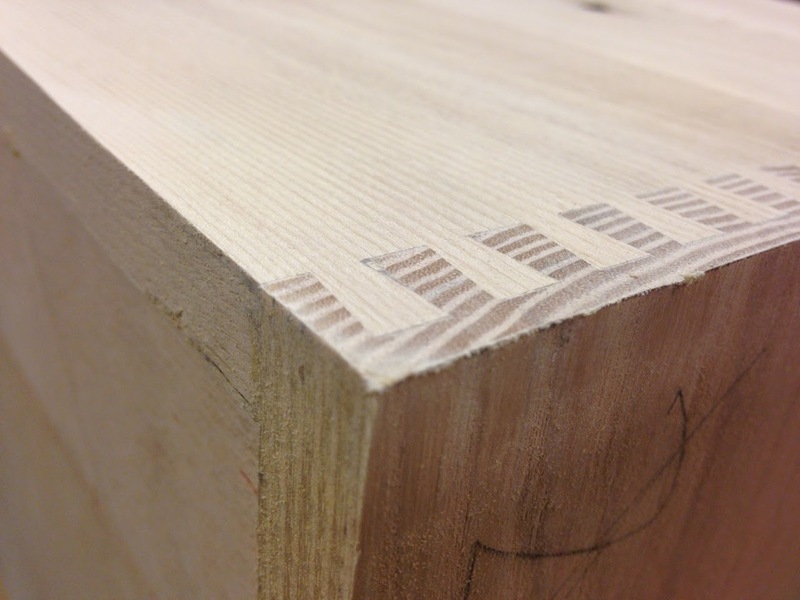 Not having your wood grain match up is a big ‘no no’ when wood working. Because of that, I had to consider how much the top would shrink/expand with the seasons compared to the side panels. I definitely didn’t want cracks! I knew I couldn’t glue the whole top surface to the carcass and decided to glue the front 1/3 of the top to the front of the carcass and add wood pieces in the back with slots where I could screw the back down. Because of the slotted screw holes, the top would be able to fluctuate more than 1/2″ without stressing. It was my first time using the domino machine for the slots and it worked perfectly! Here’s a close-up of the wood inserts. 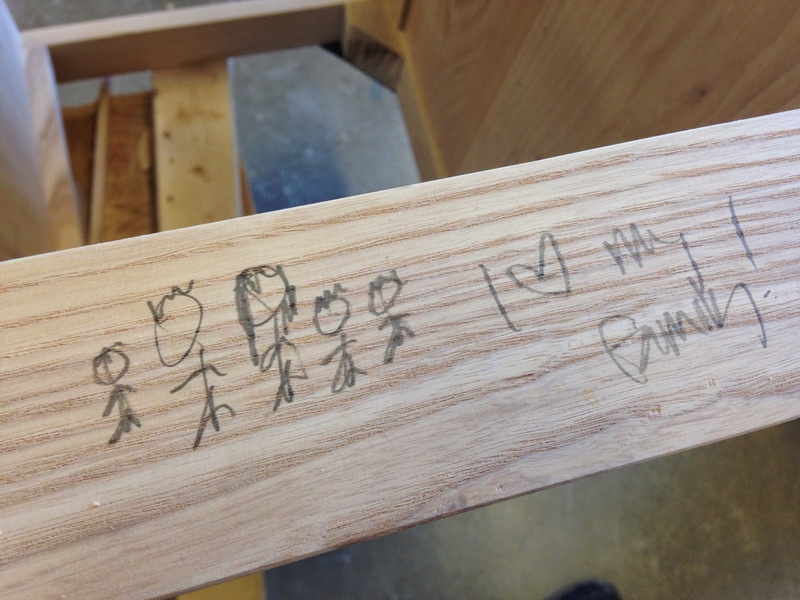 I decided to personalize my desk even more with a portrait of my family! Here I’ve glued the biscuits in the slots and in a minute the whole front rail will be covered with glue ready for the top! Here’s the top all clamped up! 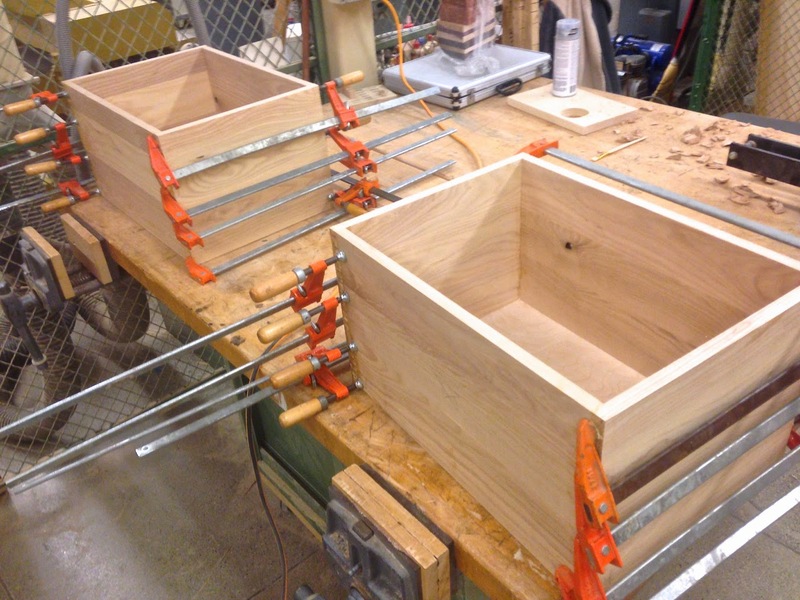 Because the clamps wouldn’t reach far enough onto the top to press down well enough, I used two large “cauls” to run down the center panels of the carcass. 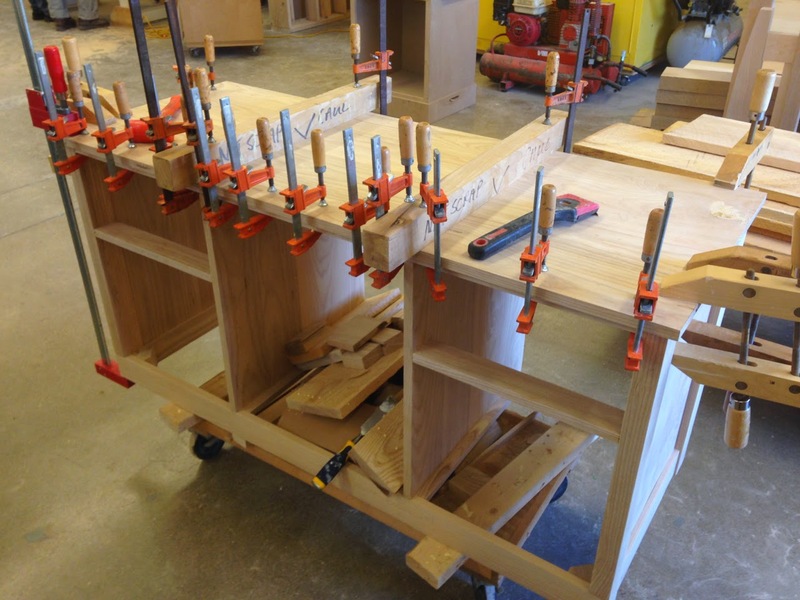 The cauls have a slight curve to the bottom edge to allow the clamps to press down more than just using a straight board. After many more classes I made the center panels for the top hutch, customized the 3 cross rails and made custom doweled joints and slots in the panels to accept the cross rails. It was a LOT of work! 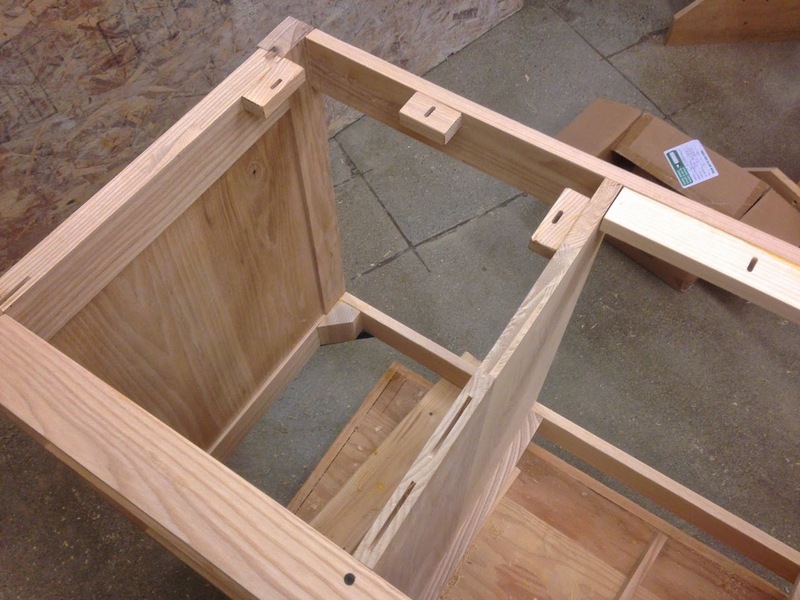 Here, the top is just clamped so I can make sure everything is fitting properly. I’m playing around with the long piano hinge I bought for the big drop-down front to figure out the best way to attach it to the desk and the door (still haven’t figured it out yet). I didn’t feel ready to glue up my top section because I still needed to make more shelf divider pieces and figure out how I wanted the drop-down door to attach and function. 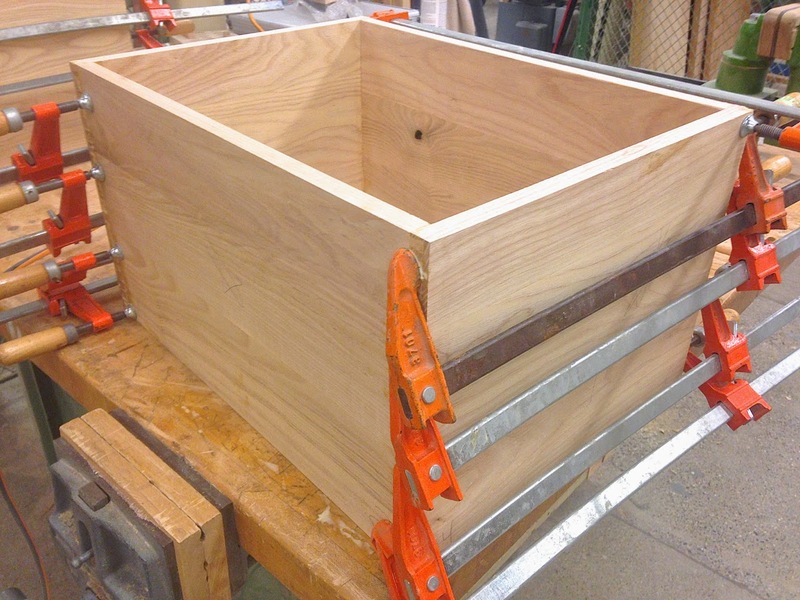 In the meantime, I decided to work on my 2 large file drawers. I took my time selecting the right-sized boards to give me the correct height of panels in the end (with just a bit to spare). I don’t have much wood to spare so I take extra precautions to ensure I’m doing everything right the first time without much to cutoff in the process. Once I got my boards squared I glued them up into panels, put them through the planer until they were my desired thickness, cut them down to the exact dimensions, made the dovetailed joints, rabbited the bottom edge for the bottom and cut the bottom to the precise size. 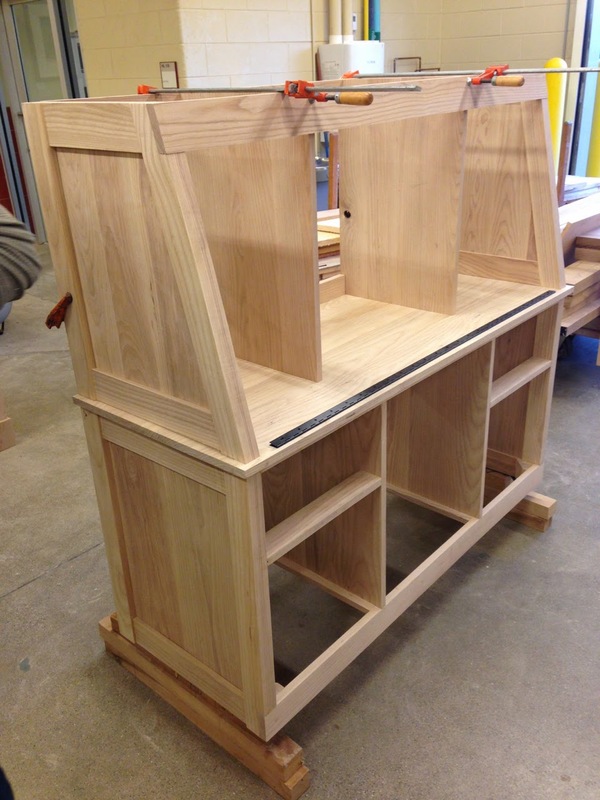 After many small adjustments, the dry fitting was finally easy enough to do the glue up! Gluing up is one of the most stressful things for me! I tense up and stop breathing because of the stress. What makes it worse is when your pieces don’t fit like they’re supposed to! It’s never a good thing to have wet glue all over your pieces that took MANY hours to make and them to not fit. Thinking of the glue drying up on me when I’m not ready is the worst! 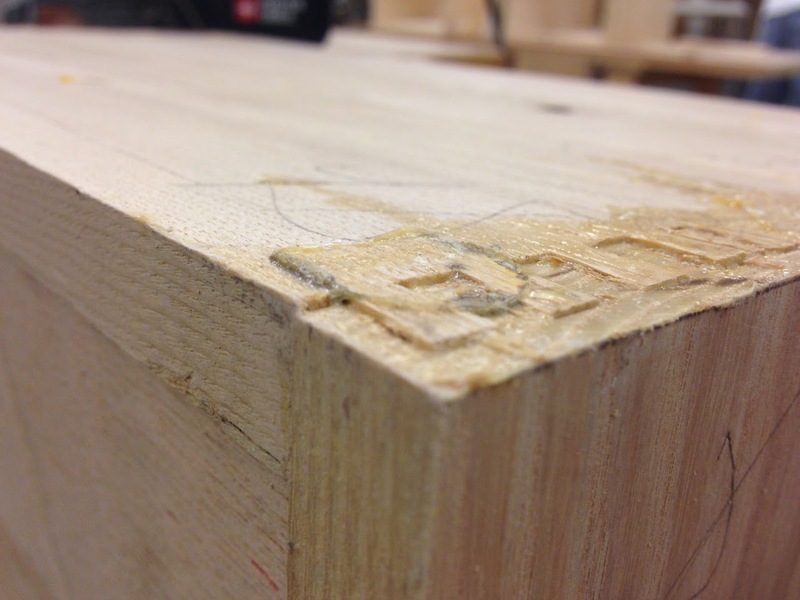 I had a few problems with some of my drawer sides not going together very well so I basically hit them with the mallet until they could have died – a few of the dovetails split in the process but I was just relieved to have everything together and square! It was funny because there was a guy working next to me on the table and I was really frustrated during the process and must have gotten a little rough with the clamps.. he had to say, “easy now!” Haha! …thank heavens for belt sanders! I also made the sides just a smidgen too wide so I could sand them down to the exact size I needed for the opening in the carcass. 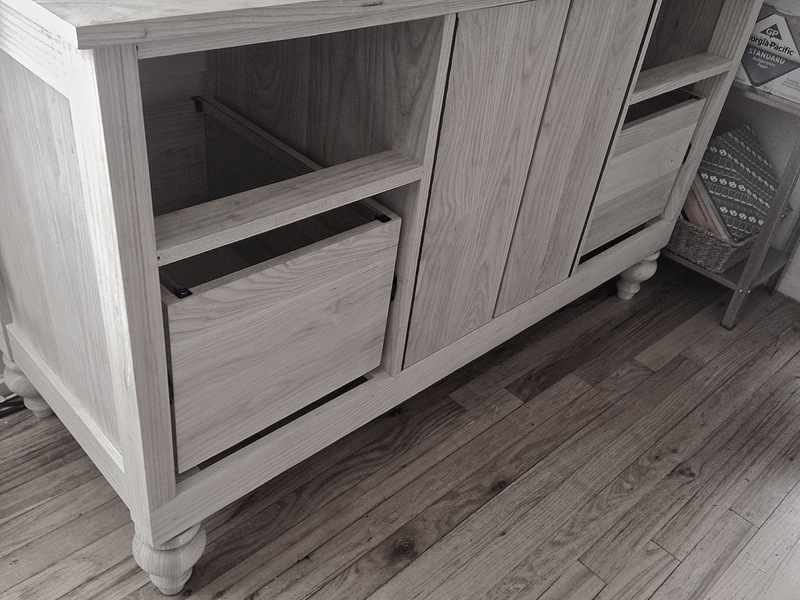 After sanding, test fitting, sanding and some more test fitting the drawers were finally looking good! 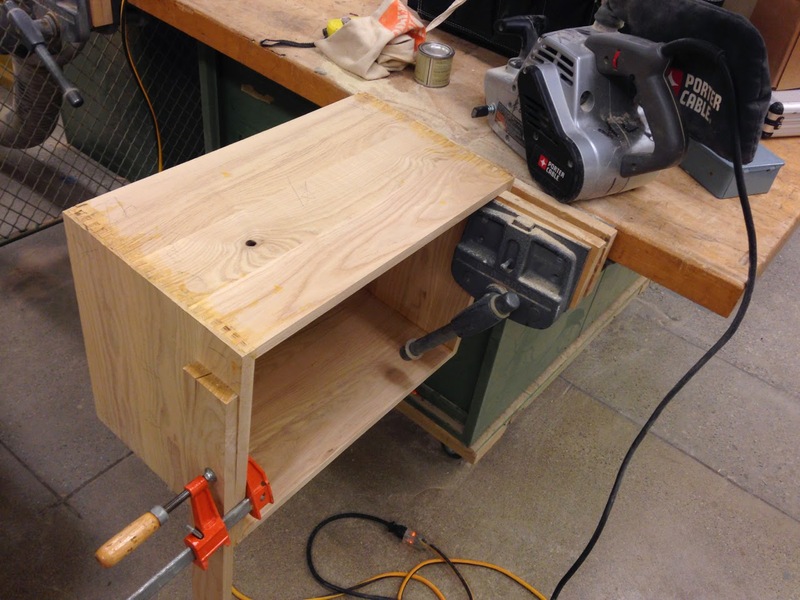 Afterwards, I finished up all the other sides and corners with an orbital sander to have perfect, baby-smooth drawers. 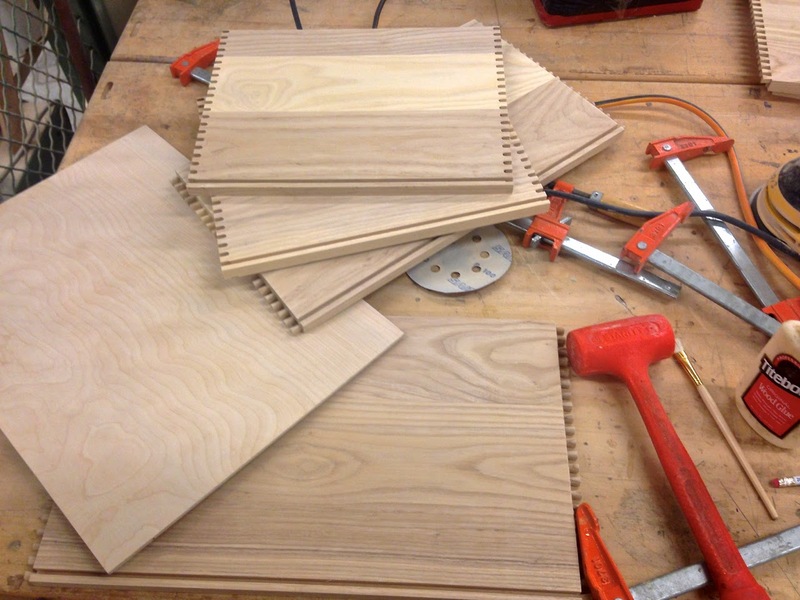 Next I glued up some boards for the doors that go in the center-bottom section of the desk. I got them sized and sanded to fit into the opening just right. 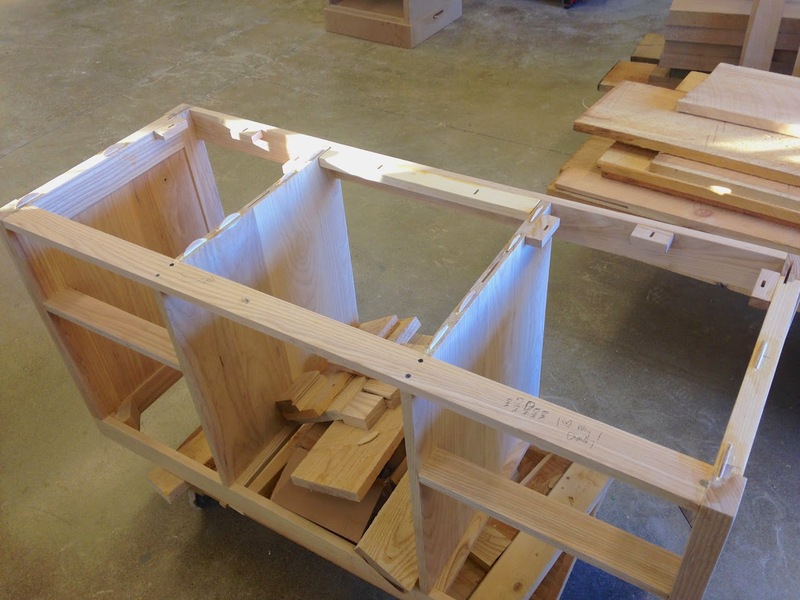 I used a long piano hinge which I cut in-half for each of the doors and got them screwed on just before the semester ended. It was hard to believe I was going to need to take a third semester class to finish, but that’s okay! I love taking the class and it’s good for me to have some “me” time away from home. I loaded up my desk and took it home for a few weeks to wait for the next class. 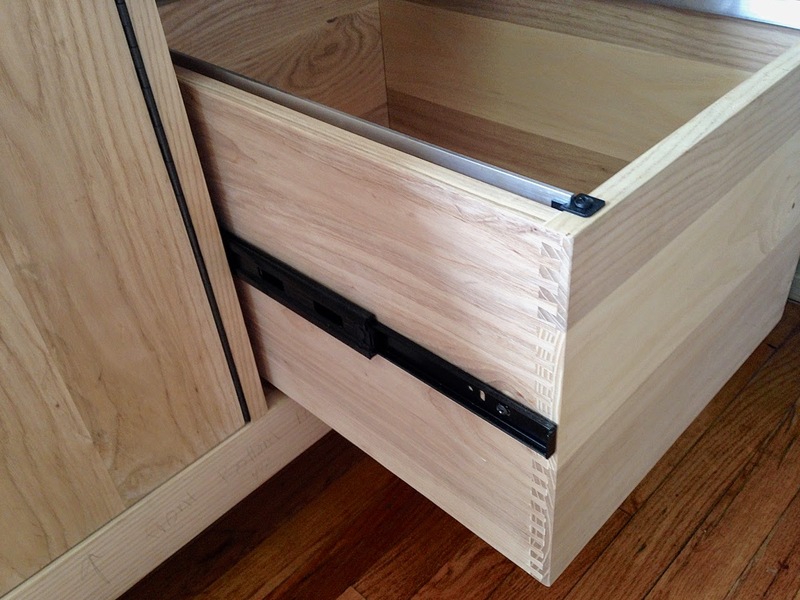 While at home I was able to put the drawer slides on, attach the drawers and screw on the file hanging hardware. It looks so good with the bun feet! 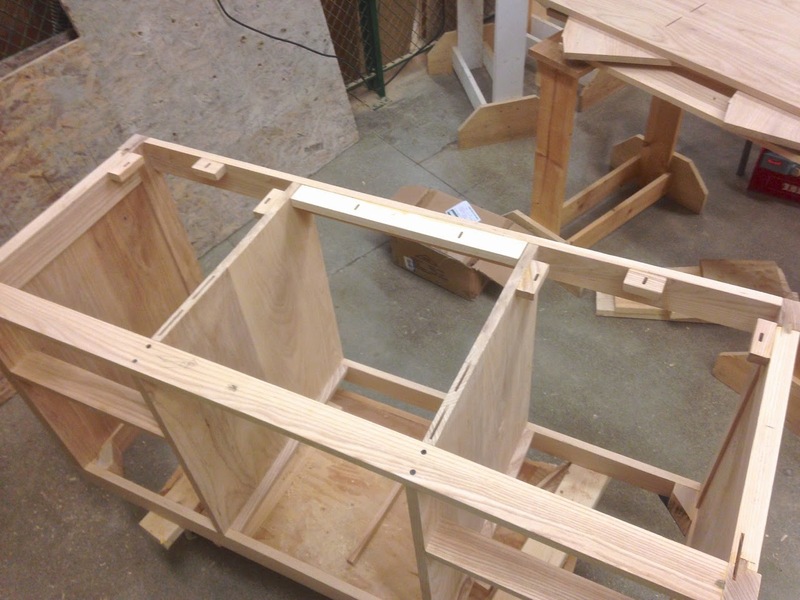 Next semester (Part 3) is going to be stressful trying to finish everything, including the stain and finish! Wish me luck! !